Along the Rock River in Silvis, Ill., Alex Stuedemann oversees the pristine maintenance of TPC Deere Run for members and the public, and for the PGA TOUR players who compete there in the annual John Deere Classic. “There’s no room for mistakes when you’re prepping a top-ranked championship course for professional golfers and television broadcasts,” says Stuedemann, director of golf course maintenance operations. That is why he oversees fertility programs centered around UMAXX dual inhibitor stabilized nitrogen, an enhanced efficiency fertilizer from Koch Turf & Ornamental. “We need to know that the course is showing its best that week, so having a product like UMAXX fertilizer that gives us predictable nutrient availability allows us to kind of tweak our program such that when we are showcased on TV, that we’re right where we want to be,” he says. Over the past 17 years, Stuedemann worked up in the ranks with the PGA TOUR, from second assistant to first assistant to superintendent to his current position, at courses in the tour’s Tournament Players Club network. 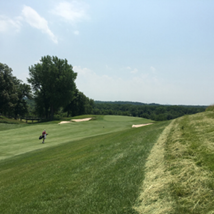 In that time, he has worked with superintendents who have implemented successful fertility programs using UMAXX fertilizer from Koch Turf & Ornamental, and based on that experience has created programs at TPC Deere Run also using UMAXX fertilizer. “UMAXX fertilizer stabilizes nitrogen in the soil, protecting it from the volatilization and leaching that can result when using other nitrogen sources,” Stuedemann says. “Really what you’re doing, as it states in the title, is you’re maximizing the efficiency of the fertilizer that you’re putting down, and in a lot of regards, protecting whether you have a watershed challenge or you’re having to report to an agency in terms of nutrient movements,” he says. UMAXX fertilizer serves as the foundation of TPC Deere Run’s fertility programs, which also include regular soil testing to determine if potassium, calcium or micronutrient applications are necessary and if pH levels are up to par, Stuedemann says. Crews combine other components with UMAXX fertilizer into spray mixtures to ensure turf health while minimizing inputs. As a result, they prevent issues such as excessive growth and thatch production that create unhealthy surfaces. When describing UMAXX fertilizer, a term Stuedemann keeps coming back to is “predictable.” The water-soluble granules can be completely dissolved in a spray tank. The EEF provides 10 to 14 days of quality response when spoon feeding greens, depending on factors such as weather and application rates. The crew at TPC Deere Run uses UMAXX fertilizer throughout the golf season, catering applications to soil tests and playability conditions, Stuedemann says. Rates also vary depending on the area of the course where crew members are applying it. “We’ll spray our bunker faces with it at a quarter pound (at 21-to-28-day intervals), and it just gives us the amount of feed we need on a longer interval maintenance program, whereas on putting greens, even on teeing grounds, we may go to a tenth of a pound, but we might be spraying every 10, or at the most, 14 days,” he says. 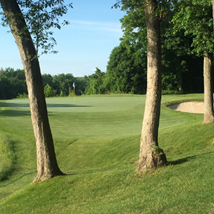 Because of its benefit to turf health at TPC Deere Run, UMAXX fertilizer allows Stuedemann to effectively manage the use of labor and equipment. UMAXX fertilizer prevents the types of flushes in growth that, when they occur on other courses, lead to higher clipping yields and debris, thus requiring more mowing, blowing and overall fossil fuel consumption, he says. A manager of creeping bentgrass, Stuedemann knows other courses with the same type of turf can get brown patch and other fungal pathogens when excessive growth goes unchecked.